Are you at the Aviation Week MRO Americas conference this week? The conference is winding down tomorrow on Thursday, April 11, 2019. 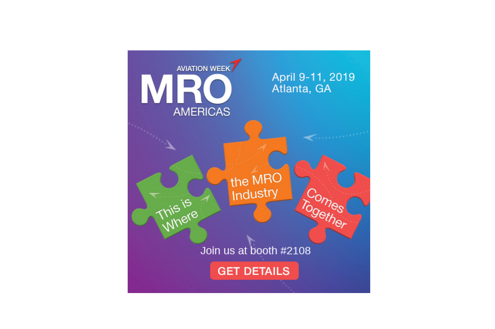 We can help streamline and boost your MRO aviation operation with our MRO team and our solution specifically designed for your business. Our Clients First ProMRO team is in booth #2108 and we look forward to meeting you. Aviation Week at the MRO Americas is held at the Georgia World Congress Center - 285 Andrew Young International Blvd. NW, Atlanta, Georgia 30303. We developed ProMRO because aviation MRO companies are burdened with some of the most rigorous compliance requirements and safety standards. Our ProMRO solution and our MRO implementation team help you leverage modern technology to keep costs low while meeting the demands of your customers. If you are concerned about using outdated, manual, and/or non-integrated systems. ProMRO integrates with Acumatica ERP software built exclusively for the MRO industry. Acumatica has ranked the easiest ERP system to use for the past two years and the fastest growing cloud ERP solution available. There is NO PER USER license cost for over 10 users. Our ProMRO solution helps to manage the complexity of aviation MRO with a modern, easy to use, and integrated system. If you can’t make the conference, contact Clients First today! We help aviation MRO companies cut costs and increase efficiencies. We'll set you up properly with the right tools to analyze inventory and labor costs, track quality, and handle all the operations and financial aspects of your business. Even if you don't want your shop floor or production team entering time and updating inventory or work orders, having a good foundation in place for a clerk to enter this information is paramount in remaining competitive. Clients First's vertical expertise includes Maintenance, Repair, and Overhaul (MRO) for Aviation or Equipment, Manufacturing and Job Shops. Contact us at 800-331-8382 or email info@cfbs-us.com. Clients First located in Dallas, Texas and Minneapolis, Minnesota serve companies worldwide.